Yesterday morning I had the privilege of joining Dr. Robert Sloan and the faculty and trustees of Houston Baptist University for the May Commencement ceremony. This was my second time to witness a graduation at HBU from the platform. There was a palpable excitement in the air at the Dunham Theater in the beautiful Morris Cultural Arts Center on campus. Parents and friends of the graduates made it no secret how proud they were as their graduate walked across the stage. And, rightly so. 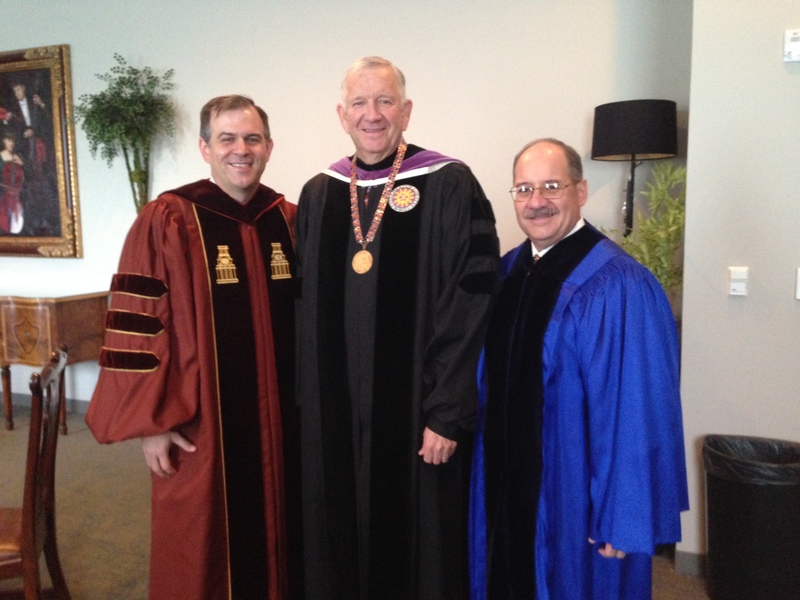 With Dr. Robert Sloan, HBU President, and Dr. Steven Jones. What I have found most interesting at the two graduation ceremonies that I have attended are the names of the students — some of which are hard to pronounce. The variety of names testify to the fact that the nations are certainly well represented at HBU. The nations are among us to stay. The last command of Jesus to “make disciples of all nations” or “all peoples” (panta ta ethne in the Greek) applies to the nations among us, not just those that live abroad. There is a diaspora of people groups from all over the world that live and study and work among us. They, too, are our responsibility. This morning I spoke at the Cambodian Baptist Church of Houston, a 30-year-old church that meets on the campus of South Main Baptist Church in downtown Houston. God has honored the faithfulness of those first generation Cambodians who came to America soon after the days of the Khmer Rouge in search of a better life. God bless whoever it was at South Main who had a vision for reaching out to Cambodian immigrants and refugees. The Cambodian church has grown over the years and will move into their new facility (constructed debt free) in August. 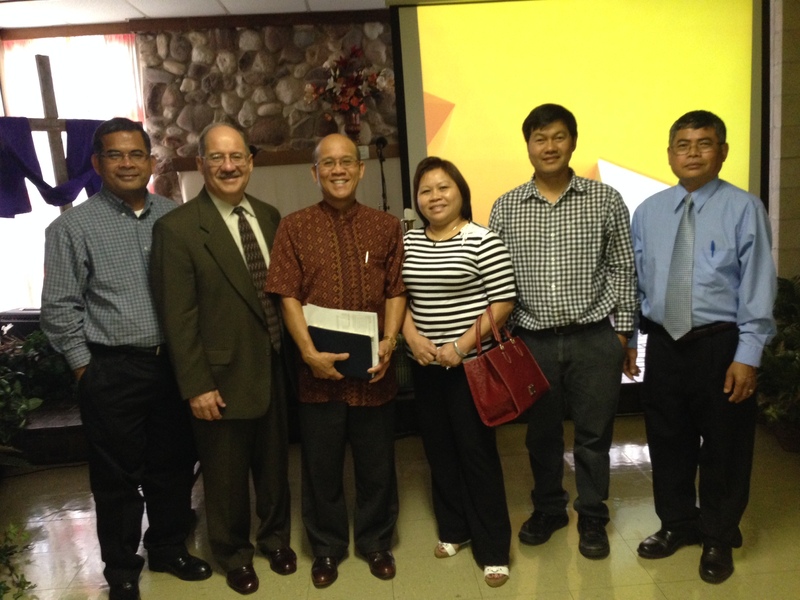 With some of the leaders of the Cambodian Baptist Church of Houston. One of the members of the Cambodian church shared something interesting with me this morning. “We are a church of Cambodian Christians but we are not only interested in reaching Cambodians. We want to reach out to all peoples (panta ta ethne).” The members of the church are not just sharing their faith with Cambodians, but with people from many nations in their respective circles of influence. They are seeking to fulfill the last command of Christ to make disciples of all peoples and not just people like them. May we also be sensitive to every opportunity to show Christ’s love and to share His message with all peoples — both at home and abroad. Thanks for your kind words and for following my blog, Johnny.